While we were on hols, the swatch mentioned in this post became the pieces of a jumper. It was my constant knitting companion, working on it while waiting to board planes/trains/buses, while on planes/trains/buses, while queueing and while having a rest from sightseeing. During that time, the friendship has had its ups and downs. At the moment, we’re on a break (as if the fold lines in this photo didn’t give that secret away). The sleeves are far too big to ease in. 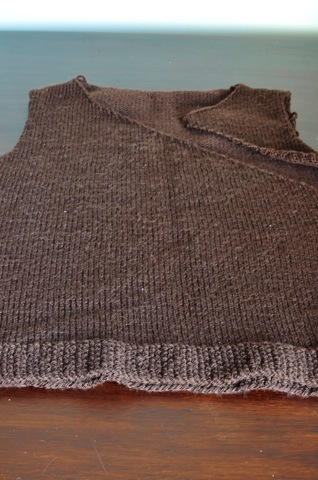 In this pattern, the sleeves are knit from the top down so the whole sleeve has to be frogged. I can’t hide my frustration, but it’s an impatient frustration rather than ‘I hate this stupid pattern and never want to see it again’. When I started seaming, I tacked the sides together so I could try it on. Besides the strangulation hazard it posed, I loved it. The body’s shorter than I’m used to, but it’s going to look great over dresses and with some of my high waisted skirts. I cannot wait to wear it, but the modifications required are just a bit too mentally taxing for me at the moment. The problems seem to be a mixture of a few things. Part of it is just how the pattern works with my body type; which can be an issue with any pattern, irrespective of when it was published. The other part is related to details, or lack thereof, in the pattern. The pattern doesn’t list a row gauge, which isn’t normally an issue when a pattern gives certain measurements to knit to. This pattern, however, is riddled with ‘knit x rows’-type instructions, so not knowing the row gauge is akin to flying blind and hoping for the best. It hasn’t really worked out so far, but there’s definitely enough good in there to keep me motivated. It’s lovely to hear that, despite all the issues and the prospect of having to re knit it, you’re still so keen to continue… Perseverance is one of the things knitting keeps challenging me to learn and I really value that part of the journey, however irritated I get. can’t wait to see the finished garment on!! I do admire your perseverance. With some projects, your just know you can get to the finish line eventually (and no one is timing you, right?) looking forward to seeing how it comes out. That does, indeed, sound very frustrating! I hope it’s all over soon and you get to wear the jumper on one unseasonably cold day! I always take it personally when a knit will not co-operate and turn out well without lots of ripping back and re-knitting. I’m currently at war with a cardigan whose yoke I have re-knit four times now. Persevere and keep at it while your alterations are still fresh in your mind!